However, several exceptional pieces in the exhibit aren’t views of Boston or New England. A spectacular standout is a symbol of Boston’s hated rival, Yankee Stadium, in the midst of its demolition. McNamara went to the Bronx to photograph the interior of the old stadium when it was in ruins, being carted away load by load by trucks and dumpsters, the concrete blocks piled up in what used to be the outfield. Using source material from 17 photos, he created a meticulously detailed image of a once-mighty coliseum brought low by the demands of the marketplace. Even Red Sox fans will become fascinated and oddly nostalgic by the unusual view of the House that Ruth Built in its death throes. 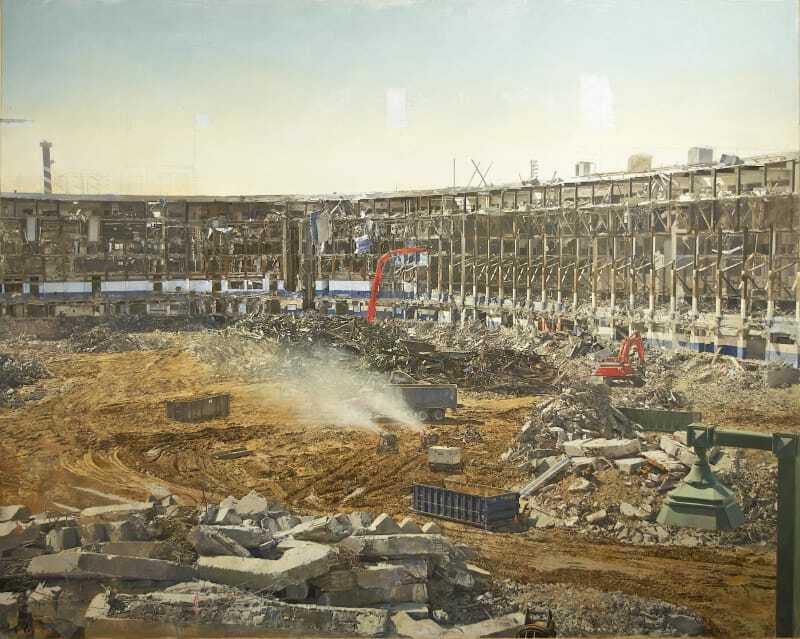 McNamara brings the same level of realism to several other pieces in the show, but despite the precision of his style, he prefers not to describe himself as a “photo realist.” He points out that a truck and two pieces of machinery in the center of the stadium composition came not out of photos but out of his imagination. And McNamara leaves pencil grid marks underneath the paint visible in the finished product. Nonetheless, McNamara’s attention to realistic detail prompted Hyland (Douglas Hyland, director emeritus of the New Britain Museum) to dub him “a modern-day Canaletto”. AS WE SEE IT: THE COLLECTION OF GAIL AND ERNST VON METZSCH is at New Britain Museum of American Art, 56 Lexington Ave., New Britain CT, until Jan. 8.